Need a meeting room in Dubai? We’ve got a few and they’re all new! Did you know that we’ve recently refurbished and extended our conference rooms and meeting spaces? You can now chose from six state-of-the-art meeting rooms, which are all conveniently located right next to the Business Centre on the mezzanine level of our tower. All meeting rooms are equipped with the state-of-the-art audio visual equipment, integrated screens, laptop computers, lighting and temperature control, sound, video and microphone systems. All our meeting rooms also benefit from natural daylight and there are spacious break-out areas, some indoors, some outdoors. If you’re staying with us overnight during your event or conference, you might enjoy our Club level rooms and suites, which are purely devoted to our corporate clients. Guests staying in these rooms will benefit from a wealth of value added services – airport transfer (one way only), free wifi, and access to our exclusive lounge where they can enjoy complimentary teas, coffee, fresh juices and light snacks during the day. Our meeting planners can help you make your next conference or event a great success. Contact them today! 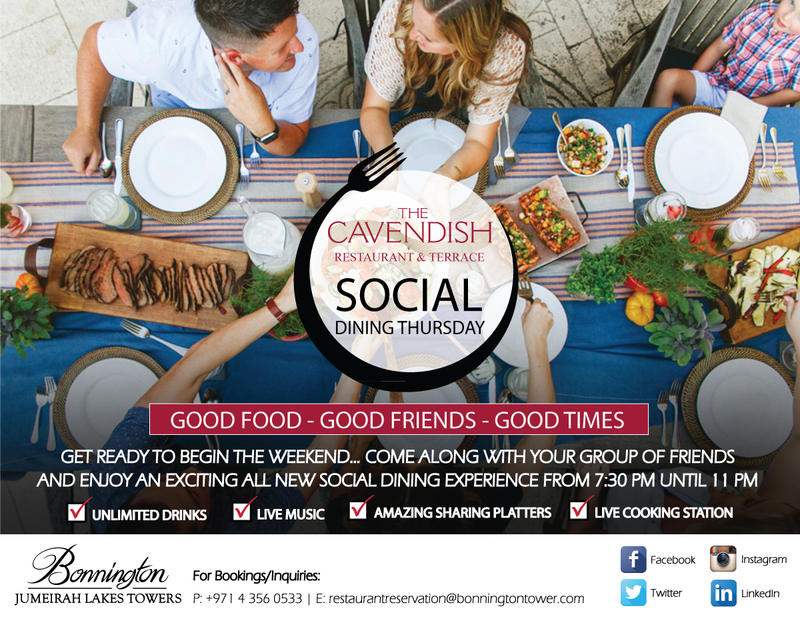 Have you tried out our new Social Dining Thursday Night Brunch yet? Watch the video the video here or see what a blogger who visited us recently had to say here. Calling all corporate hotel & events bookers in the United Arab Emirates! Do you work for a company based in the United Arab Emirates? Are you responsible for booking hotel accommodation, corporate events, and entertainment? If your answer is “yes” to all of the above, what are you waiting for? Join our new Bonnington Corporate Bookers Club group on Facebook! It’s free and you’ll get direct access to the Bonnington’s sales team, plus you’ll benefit from dedicated special offers and promotions. To join, just click here and request to be included in the group. We’ll review your application and get back to you within a few days. Once you’re a member of the group, you can enjoy one click access to all the latest info and offers for your guests and you can also contact your sales manager directly. Our sales coordinator is on hand to assist you with booking requests, corporate rates (also abroad as part of our Worldhotels membership), billing queries, and much more! Don’t delay, because we’ll soon be launching an exciting incentive program for all group members! Want to know more about the Bonnington? Check out our website, watch our YouTube channel, or follow us on Twitter!